Reywa means hope in Tibetan, and by purchasing from Reywa Fibers, hope is what you’re providing — profits from Reywa go towards tuition assistance and coverage of living expenses for impoverished children in Tibet. If that weren’t enough, Reywa takes part in grassland restoration projects, helping to improve the grazing lands of the yaks. Embrace features an unbelievable, cashmere-like softness. This yarn has quickly become a favorite among ImagiKnit staff, and we’re confident you will love it as much as we do. We were so excited to have designer, spinner, knitter, crocheter, blogger, and all around fiber artist Caitlin ffrench stop by the shop all the way from Canada. Here she is holding the much-loved Malabrigo Chunky in Frank Ochre. Her designs are chic and sweet (and most of them are free!) so there’s no reason not to make them. Visit her on Ravelry or check out her blog to learn more about the very charming Caitlin ffrench. 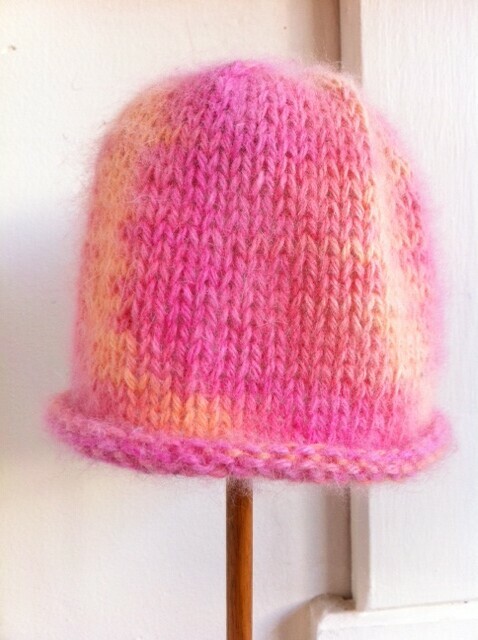 This hat is sized for a newborn and will be the hit of any baby shower! PM and join being careful not to twist. Knit all rounds until work measures approximately 5” from CO edge. Break yarn. Use darning needle to thread through remaining sts. Saturday, April 27 is Local Yarn Store Day!